The skyline of Liverpool – see how many objects point upwards in this shot – like a collection of stalagmites at different stages of development. 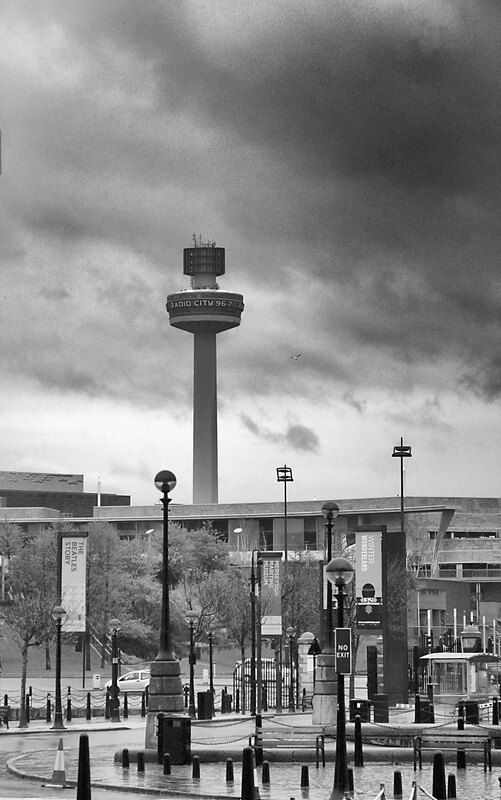 Radio City Tower (also known as St. John’s Beacon) FTM Tower is a radio and observation tower in Liverpool, England, built in 1969 and opened by Queen Elizabeth II. It is 138 metres (452 ft) tall, and was built as a ventilation shaft for St. John’s Market, however was never used as such due to a new law passed on the year of completion. It is the second tallest free-standing structure in Liverpool and the 32nd tallest in the United Kingdom. I really like this shot! As you say, how many objects point upwards? The tower is matched by all these lesser structures which gives rise to a very pleasing composition. Really nice. Thanks. I have to admit that I was concentrating on the tower when I composed this shot, and it wasn’t until I got back home that I saw the complimentary verticals. What an incredible location, well seen and captured too. Great tonal range.